In the modern times, creativity still serves as the soul of an art. Upgrades can be an embodiment of the same. Thus, the order of the day is that chefs from across the world endeavour to turn almost every modest dish into something special. However, only a few versions manage to thrive for long. Interestingly, the quest to unearth the cultural roots of all such dishes draws attention of many food enthusiasts. Between the late 1980s and early 1990s, genuine transformations of a typical hamburger were brought about by American chefs. Many of them came up with their novel variations of it, inspired at times, perhaps by the famous kind attributed to Daniel Boulud of DB Bistro Moderne, located in New York, wherein quality beef, goose liver and other lavish elements were used. Nowadays, they cook traditional Mac and Cheese in a much better way by adding truffle pieces to the cheese. Later, British chefs, also carrying the legacy for ingenuity further, shifted their attention to inculcating better cooking techniques and making use of quality elements in their preparations. To this end, Robuchon’s puree, Mosimann’s Bread and Butter Pudding, Scotch eggs and Blumenthal’s triple cooked chips serve as brilliant proofs. Particularly, Scotch egg is considered as the most happening dish. The available commercial variety of the same is made up of poor quality sausage meat and hard-boiled cheap eggs. So, the chefs decided to come up with a better version consisting of rather good quality ingredients. Further improvised upgrades included making use of, instead, soft-boiled eggs, altered mixture of flour, milk and eggs and small quail’s eggs. The fascinating fact is Scotch egg is not a Scottish dish. The English claim to have invented the dish. Fortnum and Mason, a store in London asserts to have invented the same. According to a theory, Sir Walter Scott, the author of Ivanhoe, did pen down the recipe first. Yet another speculation suggests that the dish was invented by William J. Scott and Sons, an enterprise located in Yorkshire, as a fish-mince food. Then, its origin, at times, is guessed to be in Algeria. Finally, the ultimate roots of Scotch eggs were traced by a well known food historian of the twentieth century, Alan Davidson. According to him, in the British colony of India, the English soldiers came across a curry known as ‘Nargisi kofta.’ Thoroughly liked, they tried cooking the same back in Britain. However, they found preparing the associated tomato gravy quite a task and thus, as a substitute, used a hot sauce. With time that changed with the kofta being served with any suitable tasteful sauce. Then, there came along a dry version of the Indian curry labelled as the scotch eggs. In the early nineteenth century, the British assertion of scotch eggs to be eaten with sauce clearly points to its Indian roots. 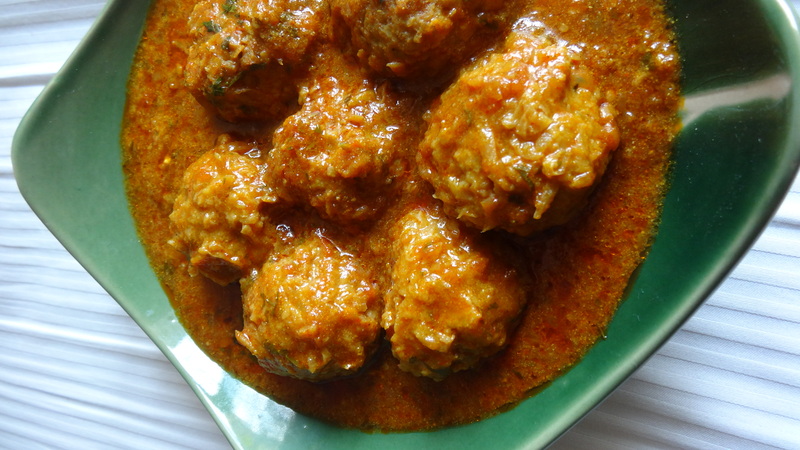 The word ‘kofta’, which is so common in the Indian cuisine, was coined in medieval India. As Indian cuisine is known for innovations and improvisations, it is said that there was once an adventurous Indian khansama, i.e., a cook who wanted to reinvent the traditional kofta curry. Thus, he coated a hard-boiled egg with lamb mince, deep fried it and did cut the same into two halves, where each half resembled Nargis, i.e., the eye of a beautiful girl. So, it was named as Nargisi kofta. Gulam Qureshi, considered to be the best and the most authentic Awadhi chef from India, specialises in both the original and his own fantastic version of the Nargisi kofta. This is otherwise a household dish in Lucknow, often prepared by cooks in Lucknow and its cousin city Hyderabad that share, quite a bit, culinary traditions and knowledge of each other. Manish Mehrotra, another famous chef from India, came up with a quite innovative and modern version of the kofta cooked with chicken mince which enables the egg yolk stay soft and sticky until the end of the preparation process. In fact, Manish keeps experimenting with modernised varieties of modest Indian dishes in order to take them to the next level of new cuisine or the even better ‘fusion’. Truly, depending upon one’s taste buds, the definitive dish from India can be enjoyed in both traditional and upgraded ways. Scotch eggs, a great filling snack, can be served as dinner with an evening drink. While its parent version in Lucknow and Hyderabad is a rich sit down dish that belongs to the dastarkhwan, i.e., a traditional dining place of the royals and eaten with distinctive varieties of dry breads or aromatic saffron flavoured rice.